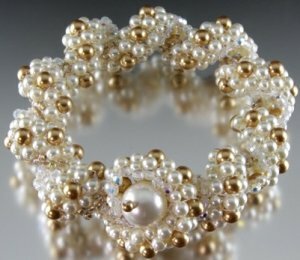 Using a variation of flat peyote, stitch Swarovski pearls and crystals to create a bracelet that twists and turns in a unique design. Learn how to make a clasp from one of spirals that nests a larger pearl. Instructor will also cover additional ways to embellish and enhance this stitch. Instructions with a full color photo of the project can be purchased for $25 in PDF format. Instructions ordered in PDF format will be sent through email within 2-3 days. If you are already subscribed, you can change your preferences or unsubscribe. Copyright © Paulette Baron All Rights Reserved.